Lasagna is one of my favorite dishes to make. Adding the spinach and sausage to this recipe elevates it. The sausage makes the meat lovers in the family happy. The spinach gets in that little bit of green which is always a positive. There is always an extra person at my house. Every Sunday there is always 10-15 people to feed. Lasagna is a great make ahead meal that feeds a crowd. I love how you can start with a basic recipe and add different ingredients to make it interesting. I have done a Lasagna Bolognese that was a big hit with the family. One year for a Christmas party I did a lasagna theme. I had two different types and I still have friends asking me to do it again. I made a sage, goat cheese, and butternut squash version and then a short rib one. This recipe has now earned its place in my regular rotation. It is a fairly simple and hearty recipe. I am sure it will earn it’s place on your family table! recipe note: If you buy the sausage in the casing make sure to squeeze it out of the casing and use a wooden spoon to crumble it into the pan. In a large pot or dutch oven, saute the garlic in the olive oil over a medium heat. Saute until the cloves are starting to brown. Then add the sausage (out of the casing, crumbled) to the pot. Brown the sausage, stirring every so often. It should take about 10 minutes. Then add the 2 cans of tomatoes, along with one cup of water, red wine, basil, salt, and pepper. Stir together. Cover and let it simmer for 20 minutes, stirring occasionally. While the tomato sauce is simmering fill another large pot with water and bring to a boil for the lasagna noodles. Preheat the oven to 375 degrees. Cook the lasagna noodles according to the package directions. Try to cook them until they are al dente, not completely soft as they will cook more in the oven. Once the lasagna noodles are done drain them and set aside. I drizzle some olive oil over them to prevent them from sticking together when it is time to use them! In a small pot melt the butter. Stir in the flour and cook, stirring constantly, until the paste cooks and bubbles a bit, but don't let it brown — about 2 minutes. Add 2 cups of milk and whisk, add in the 2 more cups of milk and whisk until smooth. Stir the mixture constantly for about 5 minutes as it thickens. Reduce the heat to low and let it simmer for another 7 minutes. Turn off the heat and add the salt, and grated parmesan. The top layer should be a layer of noodles, sauce and topped with mozzarella cheese. You may add some more spinach if you have some left over. Then pour over 1 cup of the bechamel sauce. 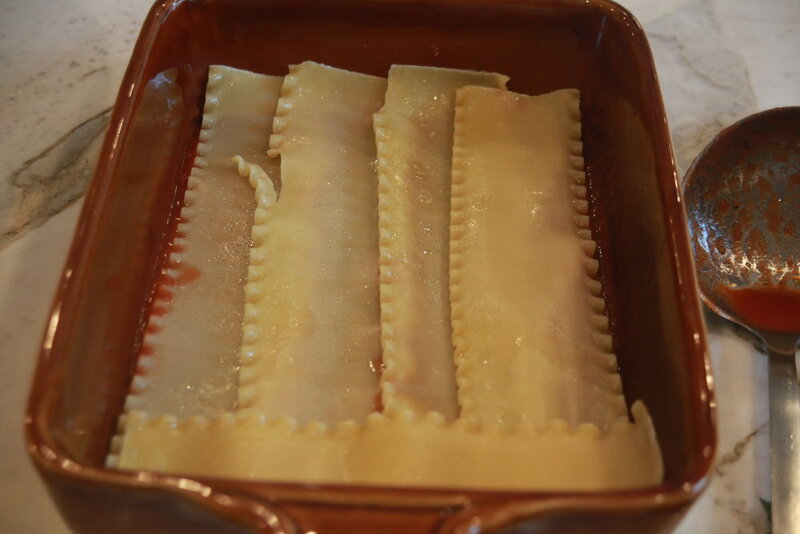 Cover the lasagna with foil and place into the preheated oven for 30 minutes. Then uncover and cook for another 15-20 minutes until the top is bubbly! Let it rest for about 10 minutes before cutting into it.